The latest BEA update on the Air France Flight 447 investigation, which was released on 27 May 2011, is based primarily on data recovered from the cockpit voice recorder and flight data recorder. This update is not a full or final report on the investigation, and only provides a small amount of the data that was contained in the black boxes. 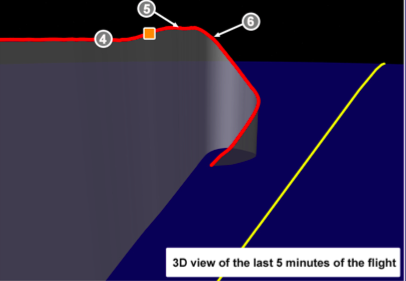 The update indicates that the aircraft experienced a stall at high altitude, and remained in a stall condition until the aircraft struck the surface of the ocean. While the update implies that combination of pilot inputs and faulty flight data may have played a role in the crash, no probable causes or contributing causes were given. - Starting at about 2:10:05, the autopilot and autothrust disengaged, and the crew took over manual control of the aircraft. Shortly thereafter, the airspeed indicated in the cockpit dropped from 275 knots to 60 knots and the stall warning sounded twice. Note that the flight data recorder only recored some of the airspeed indicators in the cockpit, not all of them. - At 2:10:16, one of the pilots stated that airspeed indication had been lost, and that the flight control system was in a condition where it would no longer automatically prevent the aircraft from going beyond an angle of attack limit. This limit prevents the aircraft from losing aerodynamic lift and entering a stall condition. The A330 would however still provide stall warnings. Note that there is no angle of attack indicator available to the pilots. 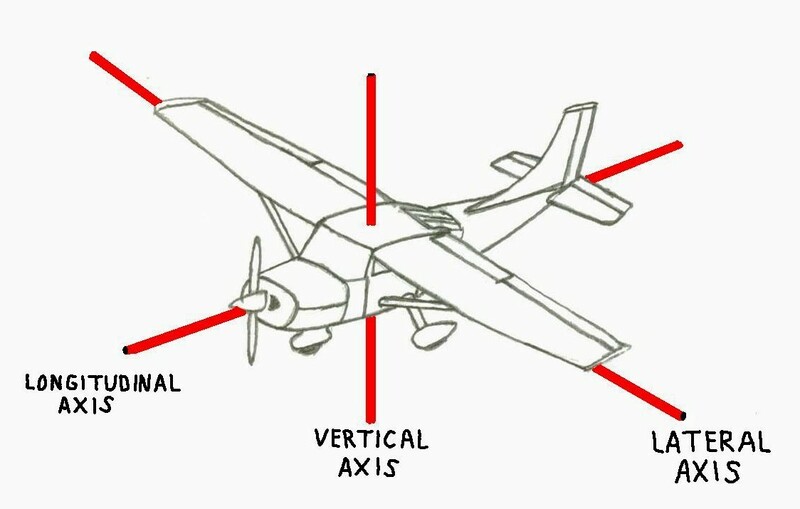 Angle of attack is the angle between the airflow and the longitudinal axis (an imaginary line running through the middle of the fuselage). 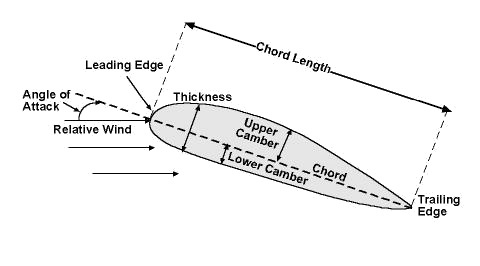 The angle of attack is the angle at which relative wind meets an airfoil. 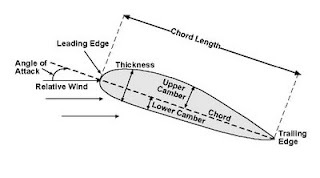 The angle is formed by the chord line of the airfoil and the the direction of the relative wind over that airfoil. The angle of attack changes during a flight as the pilot changes the direction of the aircraft. Increasing the angle of attack increases lift up to a point. Too high an angle of attack results in a loss of lift, and can cause an aircraft to stall. - At about 2:10:50, one of the pilots attempted to call the Captain back to the cockpit, and about a second later the stall warning sounded again. The engines were at a high thrust setting, and the pilot flying maintained a nose-up flight control inputs and the recorded angle of attack continued to increase, with altitude increasing to about 38,000 feet and angle of attack increasing to 16 degrees at about 2:11:06. - At about this same time, the speed recorded on a standby instrument system increased to 185 knots, and was now consistent with the speed recorded on the primary flight display. - The Captain entered the cockpit at around 2:11:40 (about 90 seconds after the autopilot disengaged), and in the following seconds, all of the recorded speeds became invalid and the stall warning stopped. This may not indicate that the plane exited the stall condition since the flight control system considers the angle of attack value to be invalid when measured speeds are below 60 knots. Also, speed values become invalid below 30 knots. - The aircraft rapidly lost altitude, dropping to about 35,000 feet with a vertical descent rate of -10,000 feet per minute. - The recordings stopped at 2:14:28. The last recorded values were a vertical speed of -10,912 feet per minute, a ground speed of 107 kt, a pitch attitude of 16.2 degrees nose-up,and a roll angle of 5.3 degrees left. - The descent lasted about three and a half minutes, during which time the airplane remained in a stalled condition, with the angle of attack increasing to and remaining above 35 degrees. AirSafe.com has started a new LinkedIn discussion group on the crash of Air France flight 447. Whether you are a LinkedIn member or not, feel free to add your comments to the discussion.